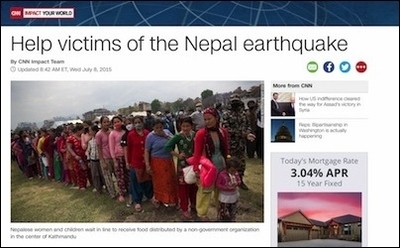 This 2015 CNN article directed readers to give money to the extremist charity Islamic Relief. Earlier this month, the Daily Caller discovered that "a number of news articles published by CNN cited groups accused of ties to terror groups, even promoting donations to one group on two occasions." Linking this piece (written by "The CNN Impact Team") and this one, the Daily Caller showed CNN's active advancement—including an explanation, with links, of how to donate—of Islamic Relief USA (IR-USA). Islamist Watch has written frequently about IR-USA, which has a long history of promoting extremist ideology across North America, and using taxpayer funding to do it. Founded in 1984 in the UK, the Islamic Relief (IR) franchise has spent many years expertly duping an unsuspecting public as to the true nature of the organization's activities. Though, as the CNN case shows, IR branches are frequently lauded as admirable human rights groups, the truth is more complicated—and more sinister. IR's founder is an Islamist activist named Hany El Banna, an admirer of Sayyid Qutb and Hassan al-Banna, the chief ideologues of the Muslim Brotherhood. Both Qutb and al-Banna advocated violent jihad and the establishment of an Islamic caliphate. 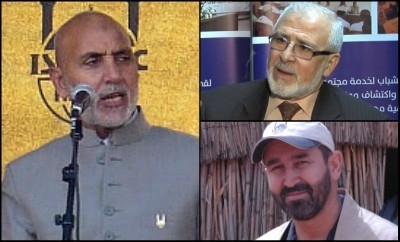 Clockwise from left: IR founder Ahmed al-Rawi, IR-Worldwide trustee Ahmed al-Rawi, and IR-USA East Coast Operations Manager Yousef Abdallah. Other IR officials have been just as extreme. They include Ahmed al-Rawi, a trustee of IR-Worldwide (the franchise's headquarters in the UK), who has called on Muslims to wage jihad against Western troops in Iraq; and Yousef Abdallah, (IR-USA's east coast operations manager) who has posted wildly anti-Semitic memes on his social media. IR-USA chairman Khaled Lamada, meanwhile, has circulated text praising the terrorist group, Hamas. Now with branches all over the world, IR has a long history of providing platforms for virulently hateful preachers as well as nurturing financial links to charities accused of operating as fronts for Hamas, the Muslim Brotherhood and Al-Qaida. IR-USA, for its part, functions as an American fundraising arm of IR, and annually sends about 20% of its income back to the mothership. According to financial reports from 2007 and 2009, IR has also received tens of thousands of pounds from the Charitable Society for Social Welfare, whose founder, Abdul Majeed al-Zindani, was a close associate of 9/11 mastermind Osama Bin Laden and, in 2004, was designated a terrorist by the US Treasury Department. In addition, according to reports from 2010 and 2011, IR has also received hundreds of thousands of pounds from the International Islamic Charitable Organisation, which is a key sponsor of Hamas. More recently, in 2014, IR was officially designated a terrorist organization by the UAE. And, in October 2017, the Bangladeshi government barred IR from providing aid to the 500,000 Rohingya refugees who have fled their native Myanmar. According to Mahjabeen Khaled, an MP for the ruling Awami League, IR is suspected of using its work as a cover to radicalize vulnerable Muslim refugees residing in the Cox's Bazar camps. CNN can and should do a better job vetting the charities it promotes. CNN's IR promotion isn't the first time the network has used its coverage to benefit or suit Islamists. In 2011, CNN sought to portray a suspect in an alleged attempted bombing as an Islamophobe, though it transpired that the subject was actually Muslim. And, in 2015, during its coverage of the Charlie Hebdo terrorist murders, the network deliberately obscured the image of the magazine's "offending" cover. All this comes in stark contrast to CNN's claim that it thoroughly "vets" every organization it promotes on these pages—including IR. So, are CNN's staff members just wildly incompetent? Or do CNN's editors deliberately ignore connections among members of terrorist networks? Either way, CNN and its "Impact Team" can—and should—do better. Samantha Rose Mandeles is a coordinator at Islamist Watch, a project of the Middle East Forum.